The eddy turbulence, generated by the orifice plate, interferes with the repeatability and linearity. 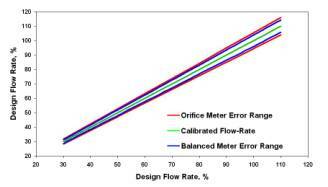 The balanced meter increased reliability results in better flow measurement accuracy. Repeatability - The A+ FlowTek Balanced Flow Meter provides a 54% repeatability (deviation) improvement, as compared to the standard orifice plate. 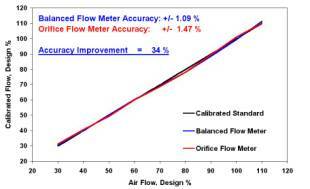 Linearity - The A+ FlowTek Balanced Flow Meter produces 34% improvement in overall accuracy (linearity), versus the standard orifice plate technology. Note: These are pre-calibration accuracies. Post calibration accuracies are within 1/100,000.